In times of disaster, living in evacuation shelters, a limited water supply and other factors can increase hygiene-related risks in daily life, so keeping clean and taking care to stay healthy are extra important. 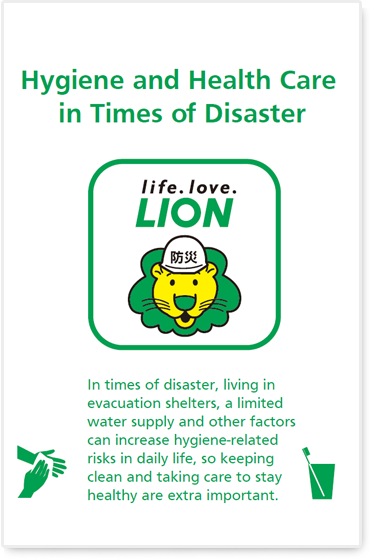 Lion offers free information about hygiene and health care practices for times of disaster that it hopes will be useful to consumers. Please feel free to utilize this information. This PDF provides information about practicing good hand sanitation and oral care during times of disaster. Keep a copy in your emergency bag to be ready for disasters. PDF Download (4 pages): Fold printed sheets down the center. A Japanese-language version PDF is available for download here.